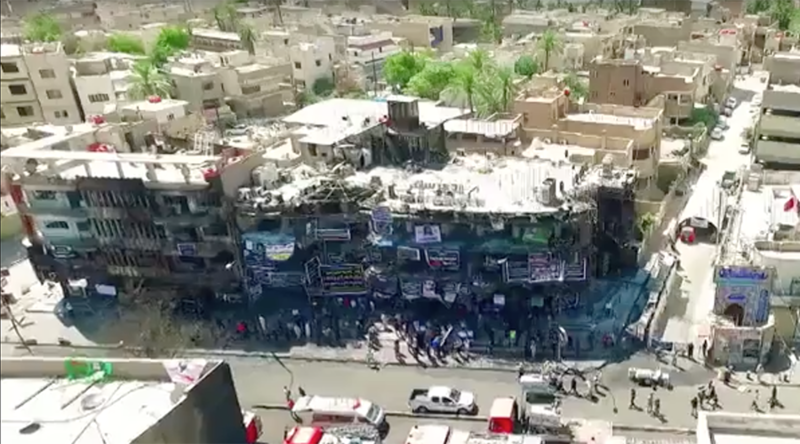 Aerial footage has emerged of the site of the deadliest terrorist strike in the Iraqi capital since 2007. The death toll from the Islamic State attack is nearing 250 and anger is growing over the government’s inability to provide security even near its own buildings. The footage, provided by RT’s video news agency Ruptly, shows the devastated shopping center closest to the epicenter of the explosion, caused by an Islamic State (IS, formerly ISIS/ISIL) suicide bomber driving a refrigerator truck laden with home-made devices into a busy square early on Sunday morning. Limp banners hang alongside its damaged carcass, with entire floors of the building, a popular social hub in the upmarket Shia district of Karrada, reduced to rubble. At least half a dozen other buildings along the street are black with soot, the result of the original blast and a fire that raged for 12 hours following the explosion. 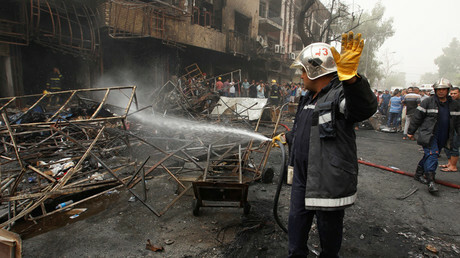 Dozens of women and children were among the dead, with many buried under debris before being consumed by fire. Mourning has been superseded by anger in Baghdad. IS has been able to consistently create waves of terror through synchronized attacks in the city, despite the authorities trumpeting successes on the battlefield. On Tuesday, Interior Minister Mohammed al-Ghabban handed in his resignation, admitting he had “failed” to impose “a unified plan” on the convoluted security structures that have emerged since the toppling of Saddam Hussein in 2003. However, residents in Karrada have repeatedly complained that the problem goes to the very heart of the dysfunctional government of Prime Minister Haider al-Abadi. He was barracked when he visited the site of the explosion, and later a crowd marched from Karrada to protest outside his residence. "We can't enjoy the Eid; if it isn't ISIS, it's Al-Qaeda, and if it isn't the two, it's the filthy corrupt politics in this country,” one Karrada woman said, according to local media. "We are being targeted while they are sitting safe and sound in their palaces. They are the ones who are allowing ISIS to come here and murder people."